Charitable organizations in BC have until June 30 to apply for a special gift from Cathay Pacific (CX) valued at $35,000. The airline is marking 35 years of flying non-stop between Vancouver and Hong Kong and has launched the contest to support a worthy BC charity while celebrating the anniversary. Charities are invited to apply by sharing a “compelling and creative” reason as to how and why it would benefit from winning. It’s up to each organization to decide on how to produce their submissions. Thirty-five years ago, on May 1, 1983, Vancouver became the first destination in Canada for Cathay Pacific, with the launch of two non-stop flights weekly from Hong Kong. This pioneered a new trend in commercial aviation, as CX was the first airline to fly the route non-stop. “We are thankful for the 35 years of loyal support from Canadians and pleased to give something back as we mark this important milestone,” says Ross Cronin, Cathay Pacific’s sales and marketing director for Canada. The $35,000 valued gift includes four Cathay Pacific business class tickets Vancouver/Hong Kong; two CX business class tickets YVR/JFK; two CX premium economy tickets YVR/JFK; eight CX business class lounge invitations for YVR; four business class lounge invites for HKG; 100,000 Asia Miles and a $3,500 cash donation. 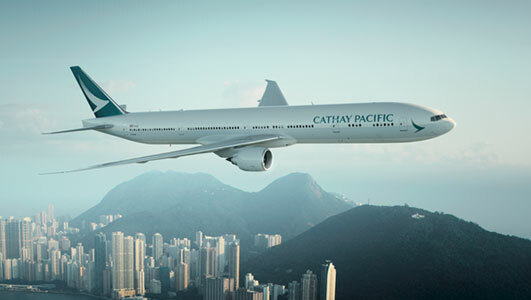 Cathay Pacific offers 17 flights weekly non-stop between Vancouver and Hong Kong, 10 flights weekly non-stop between Toronto and Hong Kong, and a daily non-stop service between Vancouver and New York (JFK). The contest closes on June 30. Visit https://www.cathaypacific.ca/35-anniversarysponsorship-contest for further details.